There are many very easy ways to get your dryer to dry your clothes faster. Below we have 5 simple methods that you can try to get your clothes dry when you really need them and in a hurry. Suggestion 1: If the clothes that you need to dry fast are something as simple as a few pairs of moist jeans, then add a large dry towel into the dryer with your wet jeans. Adding a dry towel to your dryer acts as a moisture separator. The method that works here is that by adding a large dry item, part of the moisture from the damp clothing is taken away by the dry towel. Thus reducing the moisture level inside of your dryer. This allows each item to dry much faster. You can experiment to see if you can reduce the drying time in your dryer by using this easy method. Suggestion 2: Check the moisture of the clothing needed to dry. If your clothing is soaking wet then realize it will take hours to dry anything that contains that much moisture. Put your clothes back into the washer and run the “spin and drain” cycle to completely get the extra water removed from your clothing. This will take an extra 10 minutes to run and complete. By doing this you will save drying time. 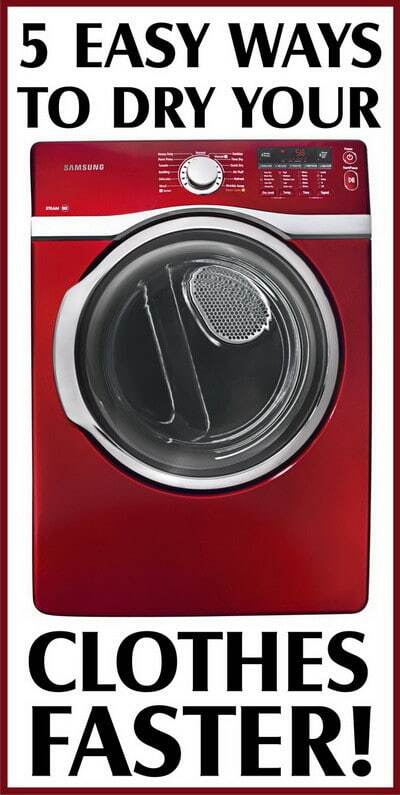 After the spin cycle is complete, put the needed clothes into the dryer and run on “high heat” for 15 minutes. Suggestion 3: When your clothes come directly out of the washer, only take out the clothes needed to be dry at that time. Separate them from the main part of the wash and put the clothes needed for now into the dryer. Put the dryer on “Auto High Heat” and run for 15 minutes. This is usually an appropriate length of time to dry moist clothing. Suggestion 4: Remove the dryer filter screen and make sure there is not a large amount of lint blocking it. Lots of lint on your filter screen can have a huge affect on your clothing not drying fast enough. So make sure to clean it out after each time using your dryer. If you do this then your dryer will always be running at its most efficient level. Suggestion 5: Before you even need your clothes dry, try pulling out the dryer from the wall and remove the aluminum colored air vent hose from either the wall or the dryer itself. Clean this large tube out by using a brush and remove any excess lint that has accumulated over time. By removing the excess lint you will be opening up the air flow so that your dryer can work in an efficient manner and dry your clothes faster. Bonus Suggestion: Make your dryer vent hose shorter. The first thing to do is disconnect the hose and clean it out by removing all of the built up lint. Then cut the hose to be long enough for you to still pull the dryer out a few feet from the wall. Cutting the vent hose a little bit shorter will get your dryer running more efficient. Depending on if your dryer is electric, propane, or gas, this can save you an average of $25 dollars per year. With the vent hose shorter, the dryer will dry the clothes 20% percent quicker.